Earth’s cycles are unblemished by time, despair, or loss. Instead, after the cold winter new leaves unfurl, flowers bloom, and cool rain causes growth. Hope. Renewal. Revival. These lovely ideas are the ones that accompany the new, leafy greenery of spring and summer. 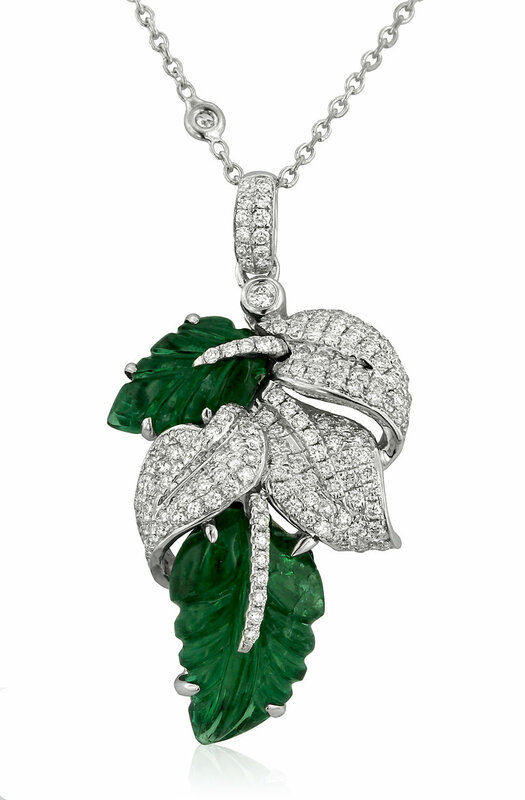 This leaf cluster pendant and earring set, made of richly hued carved emeralds and accented pave diamond leaves, is set in 18-karat white gold and symbolizes the fresh renewal Mother Nature showcases in all her blossoming glory each year. The stones were chosen by Ashley at the beginning of her career from the vault at Gumps in San Francisco. Gumps has long been known for its incredible one-of-a-kind pieces of art—and this art takes many different forms. This necklace and earring set are a true testament to the incredible elegance and artistry that Gumps always held in high esteem.